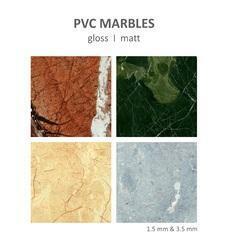 WPC Marble is a unique product brought up and promoted by HARDYPLAST in India. Made with a solid compound of PVC and Calcium carbonate it gives structure a stone like strength. This can become a replacement product for marbles and stones for Wall cladding applications. We will cater stone industry with this product with various designs of Italian natural marble. Thickness of WPC Marble will be 4 mm. WPC Laminates are a unique product brought up and promoted by HARDYPLAST in India. Made with a solid compound of PVC and Calcium carbonate it gives surface a stone like strength in high gloss and satin finishes. This can become a replacement product for High pressure laminates and High gloss PU coating in furniture shutter surface applications. We will cater furniture industry with this product with various designs of wood grains and Italian natural marble. Thickness of WPC Laminate will be 1.5 mm. PVC Marble Sheets by HardyPlast is available in 1.5 and 3.5 mm thickness with variety of marble designs. You can directly apply to the wall and replace HPL and Veneers also. 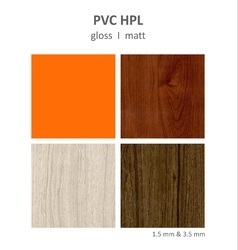 We are offering high-end quality PVC Laminates. Made with a solid compound of PVC and Calcium carbonate it gives the surface a stone like strength in high gloss and satin finishes. This can become a replacement product for High-pressure laminates and High gloss PU coating in furniture shutter surface applications. We will cater furniture industry with this product with various designs of wood grains and Italian natural marble. The thickness of WPC Laminate will be 1.5 mm.